I love sharing recipes and workouts so what better way than to send them to you! I love hearing your feedback so please send it to me. Enjoy! Quick and easy salad to enjoy during the dog days of summer. Shave the corn off the cob and place in a bowl. Add the onions, bell peppers and cilantro and mix. In a separate bowl, whisk together the olive oil, lime juice and a pinch of salt and pepper. 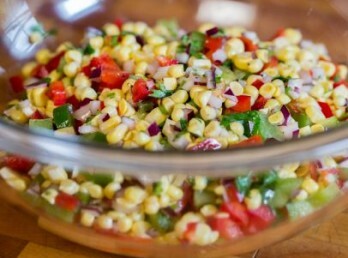 Dress the corn with the mixture, adding additional salt and pepper if needed.